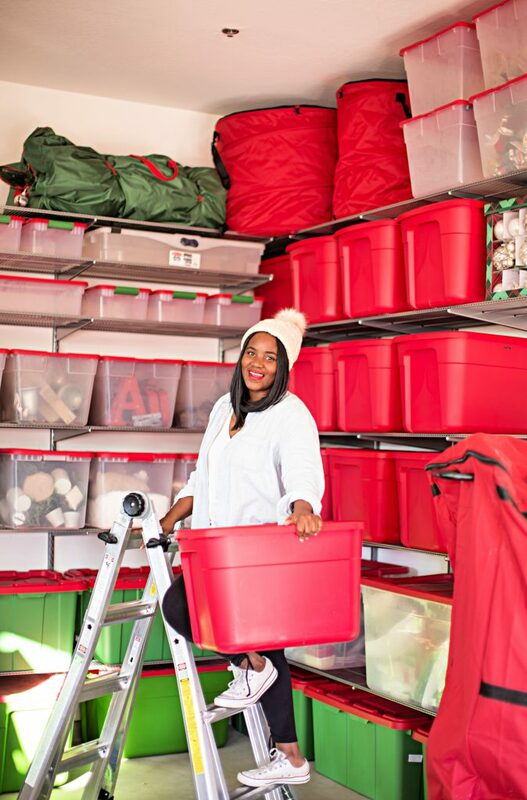 One of the most asked questions I get around the holiday season is how do I store all my Christmas decor! To me it’s no big secret. In my garage! But I totally get the interest because when you take a tour of any bloggers home during Christmas time you just have to wonder, how DO they store all that stuff. We are talking multiple trees, new decor each year and miles of garland and greenery! 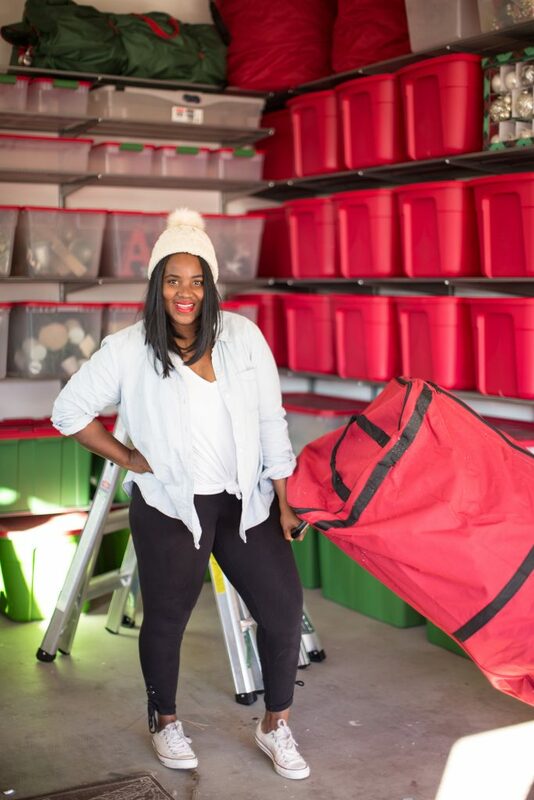 When it comes to storing my Christmas decor I have a few things in mind. I want it to save space, be very durable and easy to access! Living in Phoenix means we have garages for days. Most homes come with a 2 car garage, 3 ( like us) or 4 like our neighbors. But like most folks with garages we just don’t store our cars in there, we store all of our seasonal items in the garage as well. Last year around this time Reggie and I decided to put in some shelves in the garage to help us contain the mess. Even though we have a 3 garage, we run our businesses out of our home so we have tons of business stuff and of course Christmas stuff. 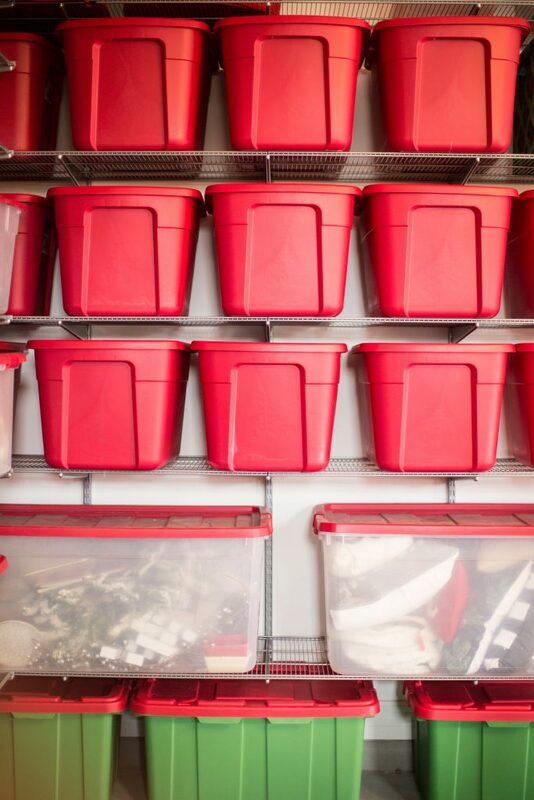 A lot of people opt to put cabinets in the garage because it looks so clean to the eye! 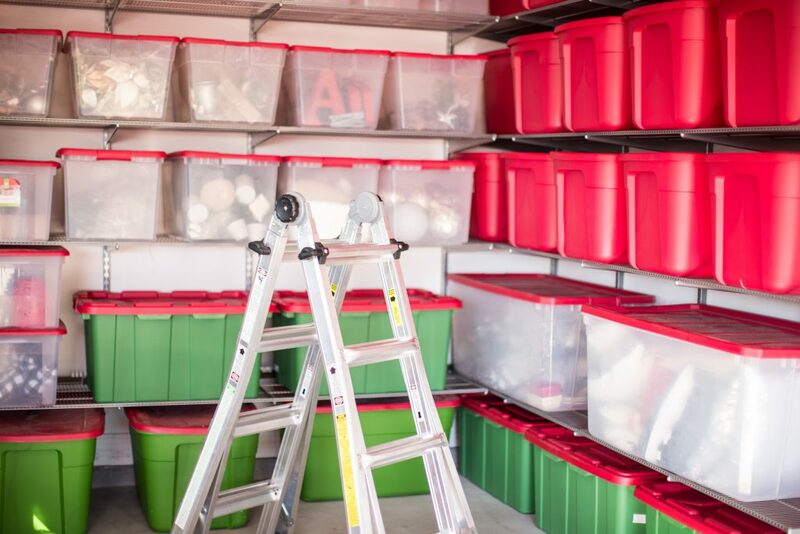 The reason we didn’t go that route is because I wanted storage all the way to the ceiling and plus our garage doesn’t face the street so we don’t have to be as diligent about an organized garage because no one really sees it! We ended it going with a completely customized system with The Container Store. They have a shelving system call Elfa that met all of our needs and we are really happy with them! More on that later. But if you’r needing a solution for all of your shelves check them out. We had them installed BUT if you or your hubby is handy then you can totally make it a DIY. Plus they are on sale right now! 30% off! This system fits in a corner of our garage and has more than enough space to fit all of our stuff. Plus it keeps me for consuming more than I can. If it doesn’t fit, I can’t keep it. If I want to keep it then I need to get rid of something else! Ive given away at least 6 Christmas trees because I just didn’t have enough room for them! So same goes for my decor. My family and friends really appreciate it and I love to spread the Christmas cheer! 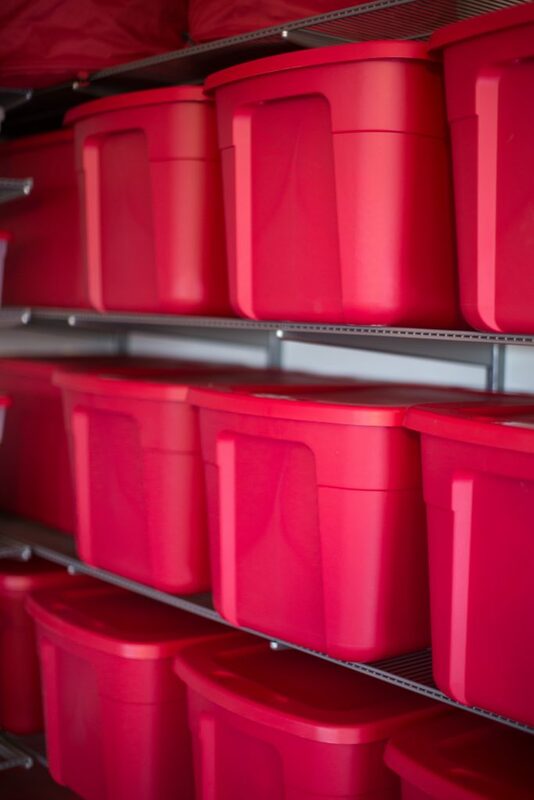 These red storage containers are the perfect solution for all of your random Christmas decorations. 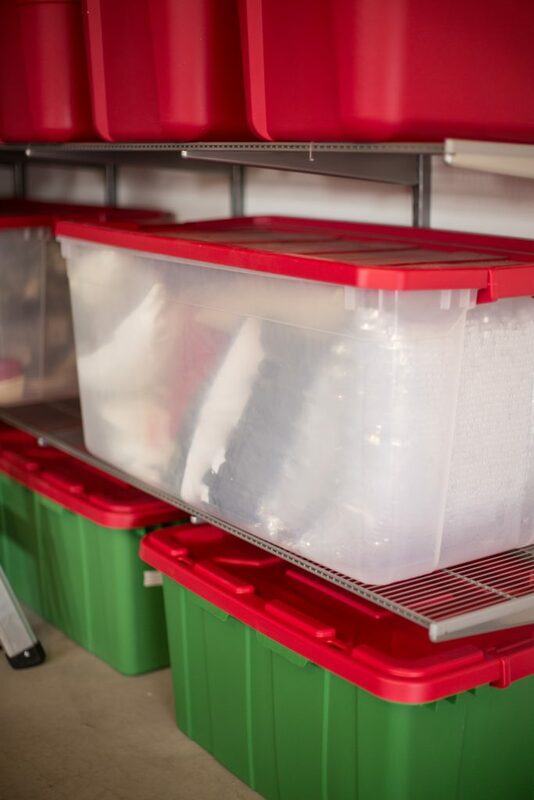 You can store tabletop, party decorations, Christmas bags, ornaments and more. Honestly I just love the cohesiveness of all the red but you can do this with any container your decide to get. This size is large enough to fit things like my advent calendar and versatile enough to store things like stocking and ribbon. For greenery I use more bins in bigger sizes and I also love these pop up bins that collapse when you aren’t using them. 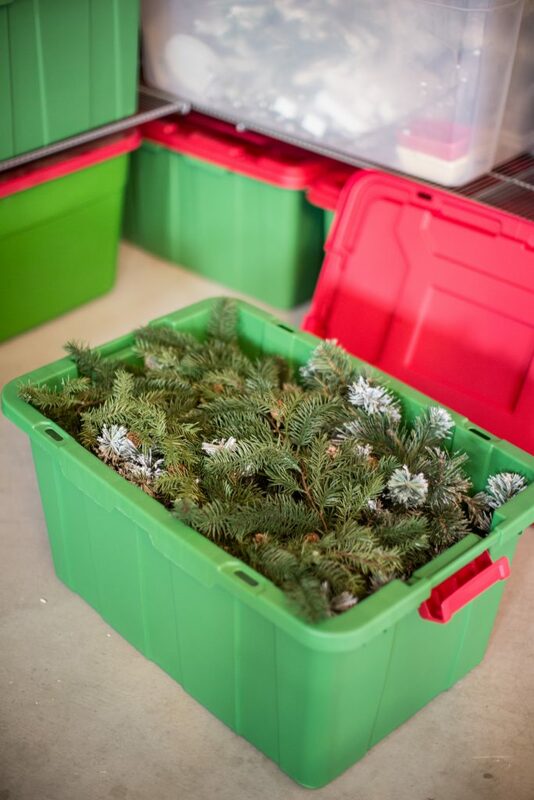 Christmas tree storage is one of the most frustrating parts of putting Christmas away. For years we would store our tree in the original box but that soon became impossible because of the layers of tape that we used to keep the box contained! Now we invest in more quality storage bags like the ones from Santa Bags. 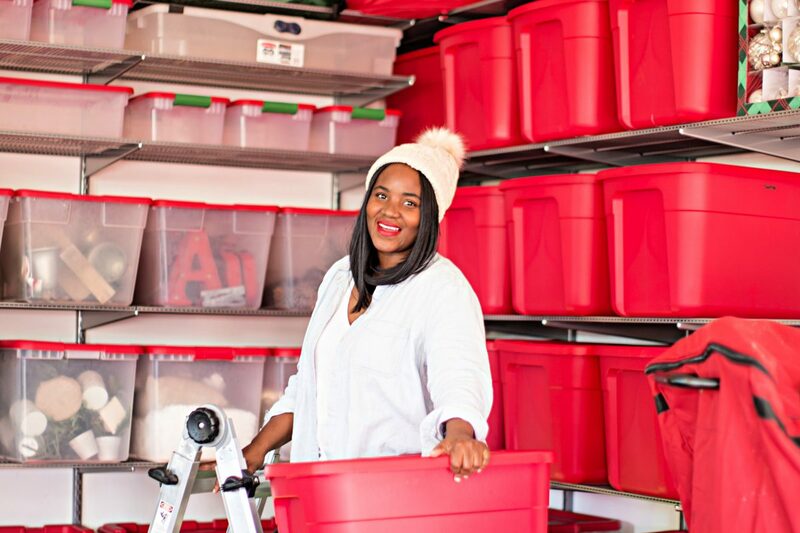 Thats all they do, Christmas decor storage! The have traditional storage bags in high quality material that protects your investment for years and years. This one we have can be stored standing up or laying down. It acts almost like a dolly and can be wheeled in and out of the garage or storage are with ease! I also use bags that are not as fancy but get the job done. 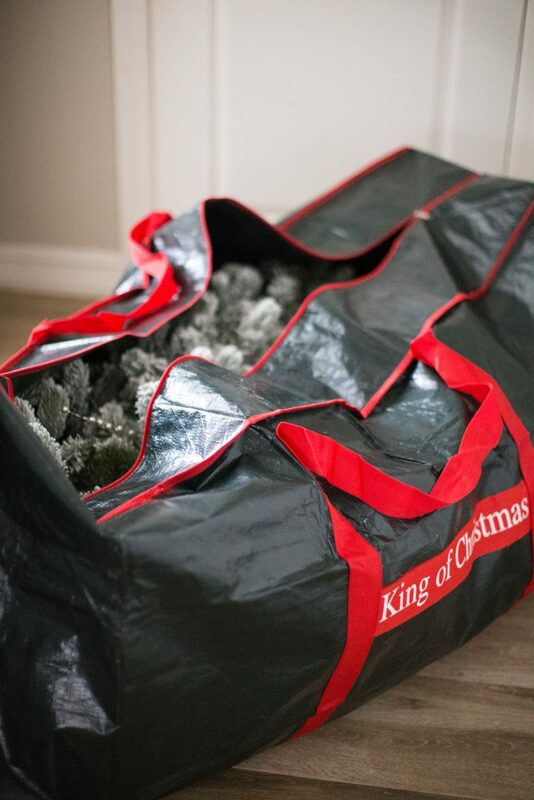 All my King of Christmas trees came with there own storage bags. So I make sure I use those as well to keep my trees protected! Ideally I would like to keep all of my linen in the closet upstairs, even seasonal ones but for now I contain them all in the garage as well. I like to use a large container like this one to store all of my pillows for the holiday season. 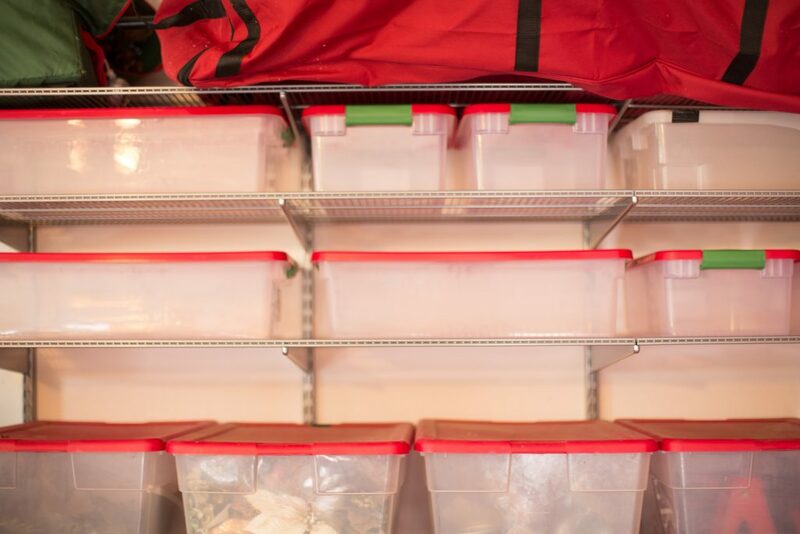 I know most of us don’t think of storing our holiday baking stuff but I do. I have a small collection of baking items I only use during the holiday so I make sure to keep them together. These bins with handles are a perfect solution! Keeping it all together makes it a breeze when your ready to start baking season. Plus all of the cupcake liners, specialty wrapping and foodie items go well in here too! I have shallow containers above my clear containers reserved for all of our Christmas lights. I find it easier to use smaller containers than to store them in one big container. Plus we can easily separate them by color and type doing it this way. You can use cord organizers to keep things from getting tangled inside the boxes! This is another one of those time consuming organizational projects I hate. Storing your precious ornaments! 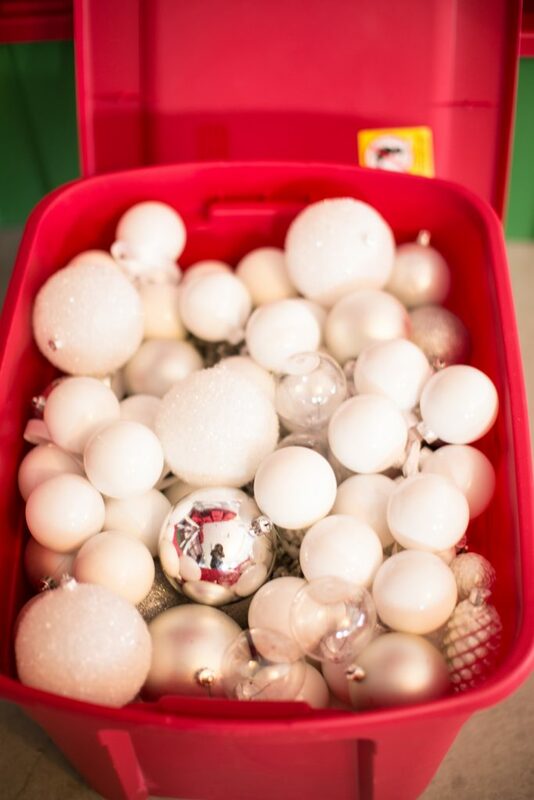 Now if you have plastic ornaments you can store them in containers by color or even size. I keep all my silver and white plastic ornament in one container along with other plastic ornaments by color. I also keep my nostalgic ornaments in one container but eventually I’ll separate them. For my glass ornaments I use special ornaments containers to store them so they stay protected. There are plenty of them out there to choose from but I love the Honey can Do containers. 48 small ornaments can easily fit in here! For anything bigger its all about packing paper and another red container! 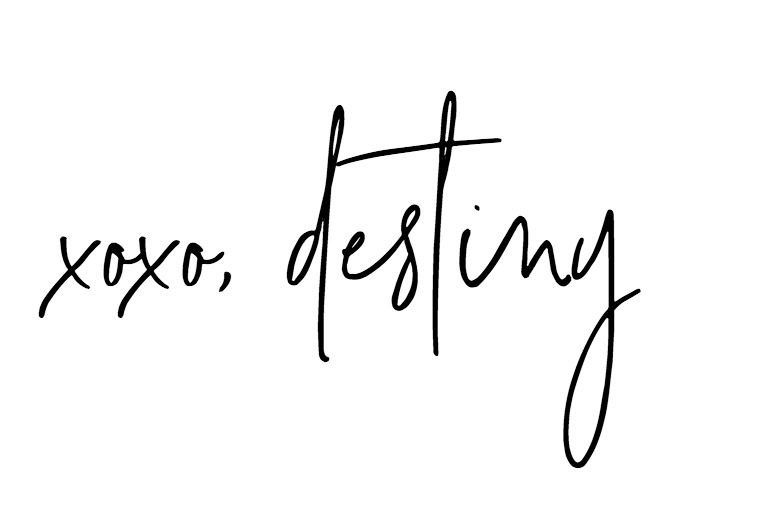 Read even more tips on The Inspired Home blog! I love that so much! The fact that you thought about the experience makes me so happy!! !